In general, past posting - is one of the most famous tricks that were causing the crash of the house edge and just the casinos profits. As always one can't hit upon such an idea, so every time group of cheaters was holding such operations. Past posting in general is the roulette strategy during which you have to put additional chips to the number which wins; or you can make a trick when invisibly remove the chips from the number which is going to lose. 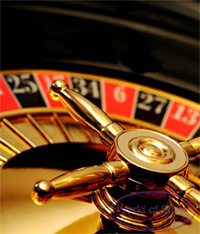 The roulette slide is considered generally to be like a subtype of the cheating at roulette in the form of past posting, where also a group of swindlers accomplishes their artifices. The origin of such a group bears the location of Italy, but not attached to this city. They were going throughout the world, grabbing the casinos. In the Bahamas they were suspected but still not seized. So, each of this group of cheaters bet 1$, but the colors were different. For example, three of them were sitting, and the fourth was standing near the dealer at the roulette wheel and didn't participate. The players were betting the stack of 20$ chips of different numbers and sections. So, imagine the situation, where that one player has 2 bets which he does with 20 chips in the first field (1-12). The second of them does the same but in the other filed of numbers (beginning from 13th till 24) and logically the third cheater makes the same bets of the same valuation but at the 3rd square with the numbers from 25th till 36. Totally they covered the layout with the help of six 20$ bets. If one of them won, their winnings were approximately from 35 to 1. They could receive for one bet 700$. But when they were losing, they were inventing the fabricated winner. This one was the person who was the closest to the winning combination or just number, and before the announcing of it, and before the dealer could put the dolly on the chips, that fabricated winner just was sliding the chips into the fortunate number position. But of course there had to be no other chips. For instance, the winning number is 10, and the cheater has 9, he could easily slide his chips exactly on the 10th location. But all these movements had to be so sharp and ingenious that even the same cheaters couldn't recognize the movements of sliding. But of course it couldn't be hold without the distraction methods. That's why the 4th gambler was needed in this situation. He had to distract the dealer while the other member of the team could do the replacement. He could do whatever he wished: ask something; require the advice of something or just to play the full, because the time here is the main deal to win. And the operation was in the greatest success when they could make a quick gain on the same roulette table, not changing it and just enjoying their unbelievable and profitable outwitting. Isn't it great? Yeah, but it really requires some rehearsal somewhere in the insignificant casino or just the most skilled movements of cheater that always has to be ready to slide the chips in the speediest way. But don't forget that everything is punished some time later!